Adam Reilly chats modelling, music videos and fans with actor/model Cole Stroud. Fresh off the set from megastar Lana Del Rey’s latest music video, filmed for the highly anticipated album ‘Honeymoon,’ Cole Stroud had plenty to talk about. The young model’s life was recently turned upside down when he made the leap from Texas to California in pursuit of the American dream. The project he was looking for fell into the lap of heartthrob Stroud when he was sitting at home one evening watching television with fellow model Austin Kellogg; out of the blue came the news that he had been booked for the opportunity of a lifetime. Del Rey is known for her cool, jazzy visuals surrounded with an atmosphere of film noir and the nostalgia of an old Hollywood. Stroud tells Motley that “the style and vibe of the video is super chill. Just a bunch of us guys hanging out and having a good time.” This adds to the evidence of a rumored first single ‘Music To Watch Boys To’ and upon being questioned the charming socialite replied “I could not for sure tell you if the video was for the song MTWBT, but to me it would sure make sense if it was. We all were not told too much about the video and I don’t want to spread any false information so I’m waiting just like all the rest of her fans!” Stroud had no light to shed on the release dates for the secret project telling readers that he “honestly was not told whenever the video is going to come out.” but he was able to tell us that some scenes were shot at the Korean Bell Of Friendship and other locations around that area. 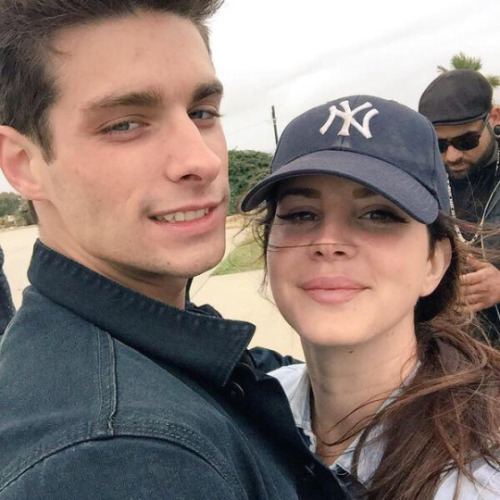 Stroud confirmed in the interview with Motley Magazine that Brooklyn Baby Del Rey is in fact shooting several music videos, he says “I know she has more videos she’s going to be shooting so it could come out soon or it could come out after she finishes shooting the rest of the videos.” LDR fans everywhere can now rejoice! Stroud’s social media has blown up considerably since news leaked that he was working on the project but we’re sure the real change has yet to come, we imagine that when the music video drops we’ll be seeing a lot more of Cole Stroud. Now so more than ever there is a tremendous amount of pressure placed on the shoulders of young models and actors who are trying to strive for success in an industry that demands perfection. On being quizzed on these pressures Stroud tells us that he; “doesn’t try and look beautiful it must just be the good genes I was blessed with, you would have to thank my parents for that one! I honestly just got into modelling not too long ago but it’s unfortunately not something everyone can get into. If you have the “look” that the client wants, then you get booked.” Needless to say, Stroud certainly has the looks, the jawline and the whole package what better way to make a name for himself than kick-starting his career off with all a star as globally renowned as Lana Del Rey.